As busy parents, the idea of having the kitchen out of order for a week or so is possibly the stuff of nightmares. Being the heart of the home means that the kitchen works hard, whether we’re cooking, chatting with friends, catching up on each other’s days or teaching the little one how to cut their food properly – in short, the kitchen goes through a lot. So if yours has seen better days but you don’t have the time or the budget to overhaul it completely, then don’t worry. 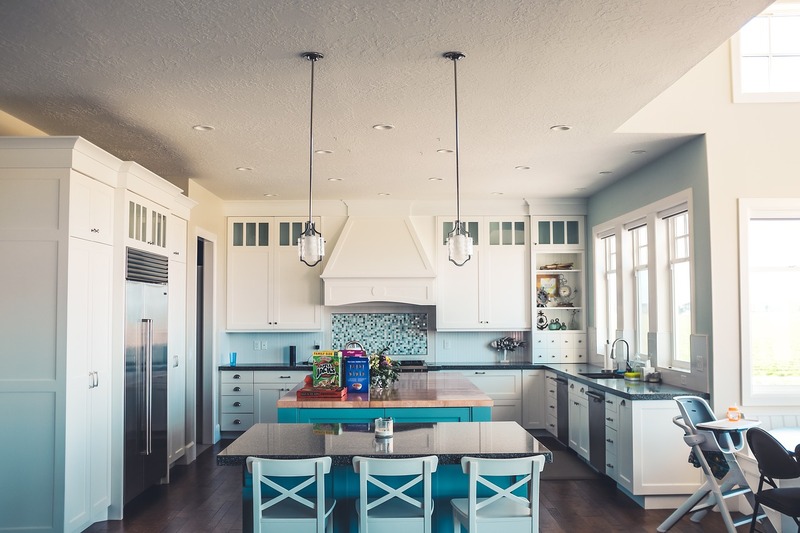 Here you’ll find 5 easy ways of how you can transform your kitchen without disrupting the whole household too much! Kitchen lighting is pretty crucial and we all know that when one light bulb goes, you can guarantee that all the others will blow before you’ve had a chance to get to the shop to get replacements! So, why not upgrade your lighting completely? Investing in LED lighting will not only give your kitchen an instant lift but also last longer and save you money in the long run! For more information on LED lighting click here. Or, if your budget is more modest, try changing your light fixtures for something more modern instead? Pulling out your kitchen units and spending an absolute fortune on a new kitchen design just isn’t practical for some of us. So, why not compromise? If you love your current kitchen but it needs a little TLC then why not paint your cabinets to freshen it up? You could repaint them in their original colour or completely alter the style of your kitchen with a bright bold colour or something a little subtler like a shabby chic colour and style. We accumulate so much stuff over the years, and most of it seems to end up in the kitchen! If you can, spend an afternoon sorting through your cupboards and drawers, decide what you’re going to keep and what needs to be either binned or relocated. Clearing your drawers, cupboards and kitchen counters cost nothing at all, but if you wanted to improve things further, consider purchasing storage baskets, tubs and racks from discount stores and have them on hand in your cupboards – it’ll make it easier for you to find things in future. By hardware, we mean your kitchen cupboard doors and handles. You can pick these up relatively cheap either online or even in charity shops and discount hardware stores. Changing your hardware will give your kitchen an instant lift! Has your kitchen blind seen better days? Or maybe you don’t have one? Adding a new blind will dramatically change your kitchen. You can go for roller or roman blinds, vertical or horizontal, something subtle or something jazzy and colourful. And while we’re talking about fabrics, don’t forget to freshen up things like tea towels, tablecloths and even your oven mitts! Good luck! "Why Everyone Needs A Duvet Day"